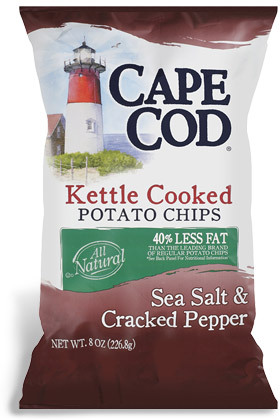 Cape Cod's superb packaging design plus its local and healthy image evoking lighthouse make it one of the few brands that can get away with such a bag dominating logo. We do have a rare criticism of this particular bag though - why burgundy for the color? A grey or black color would possibly suit the flavor a little better. When color coding flavors it is always preferable to include a flavor representative color. That is the same review as with our full fat version review, and we would emphasise the point about color, because we would include a different brush stroke color at the top with the reduced fat info in it. This would turn it into a two dominant color bag with the secondary area a standard color for the reduced fat versions. Chip Snap Test saw a good sized Chip break in half with little flecks flying around, just as with the Original version. The crunch may have been a little less audible, but it certainly was not significant. With some skin on the edges of the Chips to add to the 'All Natural' feel of the flavor, they also had relatively small bubbles that suggests they may not have spent as long with the oil as the higher fat version. They had a less greasy feel, which in some respects detracted a little from the Kettle Cooked nature of the Chip, but there were still some clear flecks of seasoning. A peppery smell was the aroma that greeted us when the bag was first opened. This died down a bit as the bag was consumed. There was a warm, slightly creamy background flavor, but the main hit was a bounce from salt to pepper and back again, with pepper being slightly dominant. A very good version of the flavor. That is exactly the same write up that we wrote for the higher fat version. Perhaps the reason for lack of alteration in the taste was because of this little section of writing on the bag, "Than The Leading Brand of Regular Potato Chips." They are not reduced the fat from their own version, but someone else's - very clever marketing.